The Calvo de Mora make, like the other Spanish tailors, is light but heavier than the Neapolitans. There is a definite shoulder pad and structure to the chest, but neither approach the English level of canvas and padding. The shoulders, as a result, are quite natural, with a tiny lift towards the end. The 3-roll-2 buttoning works quite fluidly, but with the top button entirely hidden in the roll. The lapel is wider than most contemporary styles (3.75 inches) but as with many of these elements, Calvo de Mora will make any width required. I deliberately asked for the house style for illustrative purposes. One distinctive but subtle aspect of the Calvo jacket is the lack of skirt. Although the foreparts are quite open below the waist button, the sides sit close to the hips. In a shortish, casual jacket like this I like that style. A longer, flared skirt works better in more formal jackets (like my Huntsman**), or suits (like my Chittleborough & Morgan). The finishing is very good – and it is this as well as little points of fit which elevate it above the other two Spanish tailors (Reillo and Langa). The back is beautifully smooth – which you can’t really see on the photo below, given I’m turning my head. That distorts the drape around the hips too. Calvo suits start at €2500, which puts them the most expensive of this Spanish collection but I think great value for money. They have visited London once, and are making plans to do so again. Contact the team on their website for details. It may well occur to readers that this jacket is very similar to the one I am having made at Ferdinando Caraceni. That is slightly lighter, cashmere and herringbone, but it is still pretty similar. The only explanation I have is that I realised last year I was definitely missing mid-grey jackets in my wardrobe (they’re just so versatile), and I didn’t know how this one would turn out. I also had a waistcoat (pale grey wool, with wool back) and dark-green cotton trousers made by Calvo, but more on those in another post. In the rest of this outfit, by the way: blue linen shirt by Luca Avitabile; black knitted tie by Drake’s, brown/black/white silk handkerchief by Tom Ford; and (as with the pea coat shoot) trousers by Chittleborough & Morgan with Edward Green Top Drawer shoes. *Or perhaps it is consistency of quality. Certainly, I have found on- an off-Savile Row that the more expensive houses deliver better quality (make and fit) more consistently. **I finally had my Huntsman jacket fixed last week, after David Ward had failed to match the checks originally, either at the belt or collar. Pat Murphy managed to rectify both points, as well as improve the action back. You can follow the discussion on Calvo de Mora donegal jacket by entering your email address in the box below. You will then receive an email every time a new comment is added. These will also contain a link to a page where you can stop the alerts, and remove all of your related data from the site. I was interested to hear about the rectification of the pattern matching on your Huntsman tweed – a point I’ve been wondering about since I saw the final fit pictures. I myself face a similar issue with a recent project with a new tailor (not with Huntsman unfortunately!) and was wondering about such rectifications. While your issue seemed merely confined to the collar and belt, and perhaps a minor misalignment between the sleeves and the back, my issue is with the chest and sleeves from the front. I’m assuming this will be possible to rectify, but will require more cloth and perhaps a deconstruction of the jacket? Any thoughts? Especially on the (possible) expense and time involved. Thanks! Very nice indeed, good job! Could you post a detail of the cloth, I can not discern the Donegal “dots” and I’m interested how far they “disappear” as sometimes a Herringbone pattern would as well e.g. The Permanent Style tweed by Breanish. Finally, the shape of the breast pocket strickes me as odd? Sure – Caccioppoli grey donegal 530117. You’re right, I was going to mention that on the chest pocket, it is a little too far round and has an odd shape on the front edge. I would certainly change that if doing it again. No, not really. Donegal is more a pattern, unlike say Harris Tweed. There is certainly Donegal tweed that has unique aspects to it for being made in Ireland, but pattern is not one of them. very nice jacket. Quick question: what are your favorite trouser colors to pair with mid-grey? The pictures above show a dark grey (?) – what else would work well? Interesting point on the lack of skirt (unless I’m confusing the function of the term) – to my untrained eye, the jacket still adequately covers the rear, putting it a significant step above the fashion for jackets at the moment. It doesn’t appear to be much shorter than the Huntsman. Or are you specifically referring to the front of the jacket, and the opening up of it past the second button? I’m referring to the width of the jacket at the bottom, rather than the length. Have a look at how the jacket curves in towards the bottom. I really like these pictures and the post Simon. 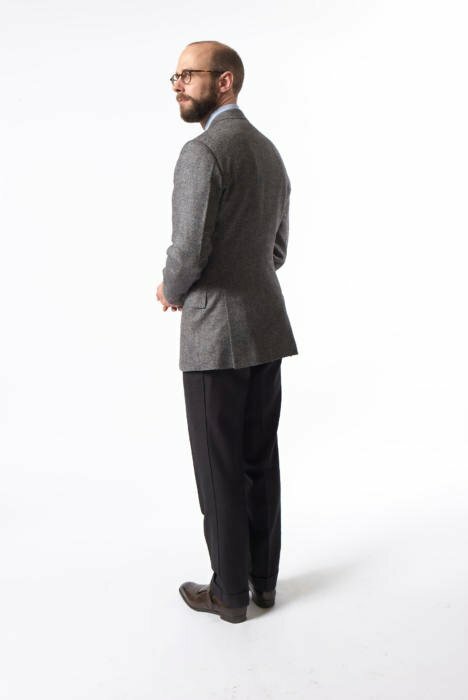 The jacket looks great although it seems to be a better length from the front view than from the back – maybe this is a photographic optical illusion? 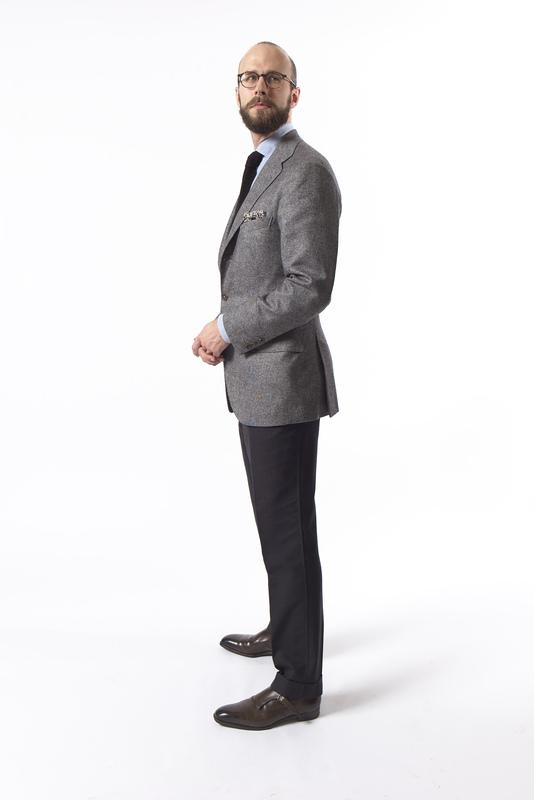 The lapel is wide, but this gives the affect of slimming down your shoulders rather than narrowing the lapels slightly and making your soulders look a little broader – is this what you wanted or did you give them carte blanche to make the jacket as they chose? I think that is photographic (as per usual) yes. I asked for the house style, and gave them pretty much free rein. Fabric of jacket and trousers? Fabric on comment above for jacket. For trousers I’ll need to go back to Chittleborough. I’m pretty sure it’s a heavy Dugdale’s twill. The shade of that jacket seems pretty much perfect. I think the shoulders and slight snap in the waist look great. I am also a fan on keeping skirt to a minimum, especially on a less formal coat. For me, not sure the balance is quite right, particularly on the last photo, where the back looks a little short. Your shirt collar has a very nice roll to it. How is the construction? Is it unlined? Or does it have a non-fused interlining to it? Hi Simon, interesting that you compare this to your soon-to-be cashmere Caraceni jacket which is one of your projects that I have become particularly interested in given I am in the market for a similar jacket – especially tending towards the casual end of the spectrum. It is hard from the photos to discern the finer details of the Caccioppoli donegal cloth but do you consider that this will be something you might wear with jeans/chinos in a similar way to that mentioned on the Caraceni post? If so, which of these two cloths would you deem to be more suitable for a casual style, given as you say that the projects are likely to yield a similar outcome? You mention in your comments on this post cream trousers (something you have mentioned previously), and it is something i am thinking of having made now for summer. A search on your site reveals some detail about white/cream trousers but, the comments are wide and quite confusing for someone who is not so knowledgeable. In the past you have posted about some stunning cream linen trousers you had made some time ago but, when questioned about them you explained that they creased badly so i would say not a good choice for me!You also mentioned that cream gabardine is not necessarily a good choice – why? In your experience, what would you consider the best verstaile material options for both formal and informal trousers that keep the ‘clean’ look as i tend to sway towards formal? Additionally, is bespoke made in an informal way better than Incotex for example, remembering that cream/white gets dirty so quickly and Incotex can be washed and bespoke not! Incidentally I wonder what Bruce Boyer would have to say on the subject? And finally have you also considered doing some posts now on summer clothing based on simple Italian flair/1960’s for example? How is the collar on your shirt constructed? Does it have a soft non-fused interlining or is it completely unlined? It has a nice roll to it. Looks great Simon. 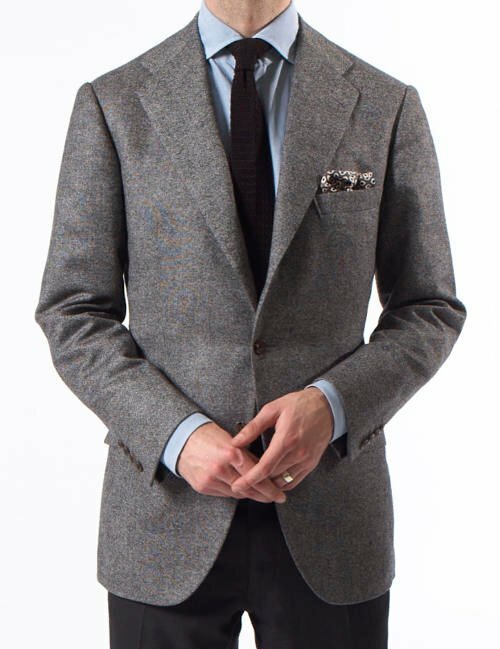 I have been thinking about replacing a mid-grey suit with a similar-coloured one but a mid-grey jacket like this is even more versatile (and a steal at this price). You don’t appear to mention the finishing on the inside. That mid-grey color is outstanding. The simple combination of blue shirt and black tie is superb! I agree on the vesatility of mid-grey,but have always been concerned that,being fair skinned, this shade would not look good on me in the autumn/winter months. As good as mid-grey looks on you, perhaps I should reconsider. Thanks Simon. On a different matter: What’s your opinion on striped suits, whether pin or chalked? Nice alternative to plains. Thinner the stripe the more versatile they are. That is a beautifully fitted jacket. It looks perfect and just how I would want mine to fit. Will you be posting some photographs of the refinished Huntsman? Be interesting to see the result. Forgot to ask, grey jacket for a white haired gent? Too washed out? Depends on skin tone more. Greys and whites can look really nice with grey hair, but if you’re very pale that’s what makes you look washed out. Sure, will do at some point. Lovely jacket Simon, it looks great. I was under the impression you’d decided the Huntsman suit was a bit of a mistake? Great looking lapels! To me looks a bit like the lapels from Liverano (which I love). Would you recommend this shade of grey as a second jacket after a navy one? Simon, the £1800 price demonstrates that going bespoke is well worth the effort, even if someone can’t avoid the top-end tailors. It might not be the very best available, but it’s a perfectly nice bespoke jacket that’s way above any R-T-W offerings. I hope it encourages many people to try bespoke at lower prices, whether in London, Madrid or anywhere else. In the end, you go to a tailor that you can afford and who you identify with. As long as the garment justifies the cost (whether high or low), that’s the main thing. What are your general guidelines to wearing a black necktie? I know Will Boehlke praises it, but most of the time I see it paired with the classic ensemble of white shirt (ocbd or otherwise) with a grey jacket/grey suit. Any other combinations? 2. black necktie ok with tan or dark brown shoes? 3. black necktie ok with tan /creme /khaki/olive trousers? 4. black necktie ok with blue jacket/blue suit plus light blue shirt or white shirt? 5. black necktie ok with a white ocbd with a thin light blue university stripe? Great question! One for a longer post perhaps, next week? Do you regularly wear linen shirts in winter? Would live to have seen a close up of the cloth particularly given that Donegal tweed is always so rich in colour. And compliments to Julian Anderson the photography is great against the background and really shows off the jacket. Very nice jacket Simon! I love the way it sits between the Neopolitan and British styles in terms of formality – a very useful middle space. As a man with a larger, ahem… saddle, I’m curious if you think it’s more flattering to have a nipped in hem like this or a more flared skirt? ‘Funny how those things go together’ is a well documented psychological condition regarding price, value, well being, etc. Not surprising you experienced it…most of us do, and it drives a lot of the luxury goods market. Simon, I notice your lapels all appear to be more than the long term standard of around 3-3.5 inches. What width do you prefer and why? I find 3.25, with a 1 1/8th lapel button works perfectly for me, but ultimately it must depend on your shoulder/half back. Simon I think it would be interesting to understand the differing creative approaches that each of the bespoke nations offer ( i.e. UK, Spain, Italy, France). I would imagine that a historical legacy would influence national tailoring styles in design and execution (i.e. military formality of SR straight shoulder vs. more casual Neopolitan shirring). Also do you find that the client/tailor interaction differs (languages accepted) I’d be grateful for your thoughts. Re. your Huntsman check suit, have you thought of getting some full trousers made to partner the suit coat thus giving it a bit more flexibility ? No, I think trousers in that cloth would be a bit much.. This is great, Simon – how do you find ease of movement and mobility? Is the jacket cut quite close? Lovely jacket from a great fabric; personally I prefer myDonegal’s woven in Donegal but there you go. You might have a look at Molloy & Sons from Ardara for machine made tweeds and there is a hand loom weaving tradition to rival Harris. For me a heavy / course tweed is the only jacketing to go with jeans in winter. When it comes to salt n’ pepper designs Donegal still does it best. Thanks John, yes I would go with original donegal if I didn’t need something lighter to wear three seasons around the office. With the grey jacket and cream chinos would dark brown shoes/boots work or is it best to go with black to tie in with the jacket more? I’m a fan of grey trousers/ tan/brown shoes and prefer brown shoes at all times but it feels like black would be a more toned match here? I guess what I’m really looking for is the best trouser colour to use to be able to wear a brown boot or tan brogue with this jacket! Could you comment on the measurements of the trousers that you are wearing in this post? I’m trying to dial in my own and the proportions of this pair look very appealing; slim but not comically so. There is a 18cm width on the bottom, and I believe 23 at the knee.